Looking for a specific topic? Browse the library of previous webinars. Couldn't make it to a live webinar? Not too worry. Most webinars will be made available within a few days of the event. Explore our recorded webinars by category or keyword below. Understanding Provenance is an AASLH continuing education webinar presented by speaker Erin Richardson and recorded on April 2, 2019. This webinar presents best practices for provenance documentation, explores outdated practices, and considers the future of museum collection documentation. This webinar is part of the StEPs Lab series of online continuing education offered to both StEPs program participants and all others interested in collections management. This is StEPs Lab 17. 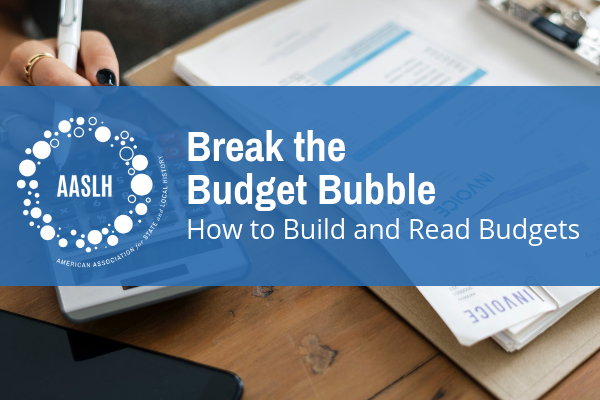 Break the Budget Bubble: How to Build and Read Budgets is an AASLH Continuing Education webinar recorded on March 20, 2019. This webinar is about budgets and financial literacy. The presenter is Becky Beaulieu. This webinar is part of the StEPs Lab series of online continuing education offered to both StEPs program participants and all others interested in financial management. This is StEPs Lab 16. Recorded Webinar: Is Your Museum Grant Ready? Is Your Museum Grant Ready? is an AASLH Continuing Education webinar recorded on June 4, 2018. This webinar is about self-assessing your institution’s grant-readiness. It is presented by Sarah Sutton of Sustainable Museums. Caring for Paper Collections is an AASLH Continuing Education recorded webinar. This webinar is about suitable housing supplies, environmental parameters for storage, proper labeling techniques, and safe handling techniques. This event is presented by Samantha Forsko. Policies and Procedures for Deaccessioning is an AASLH Continuing Education recorded webinar. This webinar is about the necessary components of an effective deaccessioning policy. This event is presented by Dyani Feige and Katherine Kane. Web Archiving: What, Why, and How is an AASLH Continuing Education webinar recorded on February 28, 2019. This webinar is about archiving web-based content. It is presented by Jillian Lohndorf of the Internet archive.